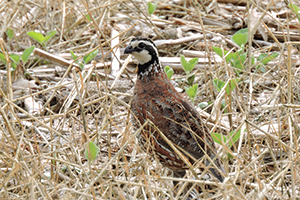 The Sassafras Natural Resource Management Area in Kent County has a brand new home for northern bobwhite thanks to a partnership between the Washington College Center for Environment and Society and the Maryland Park Service. Through the college’s Natural Lands Project, this past year 83 acres of row crops at the management area were converted to 80 acres of upland meadow, two acres of walking trails and an acre of hedgerows. The effort is to find the right balance of varied habitat types that quail need throughout the year, says Dan Small, a field ecologist with the center and coordinator of the Natural Lands Project. “A variety of factors, including development, modern farming practices and habitat fragmentation on the Eastern Shore all have contributed to declining quail populations, so being able to plant eighty acres of grassland habitat in one large block is really fantastic,” Small says. Quail, which are ground-nesting birds, are at home in the meadows and grasslands of the Eastern Shore. The new habitat on state lands was designed specifically for quail, using native bunch grasses such as little bluestem, broomsedge, and Virginia rye, as well as native wildflowers such partridge pea, oxeye sunflower, black-eye Susan and purple coneflower. Generally, the native bunch grasses take two to three years to become established, but with the abundant summer rains, the habitat filled in more rapidly than expected. In addition to serving as an ideal haven for quail and other grassland-dependent birds, the meadow will provide refuge and sustenance for pollinator insects of all kinds. This habitat is critical for baby bobwhites, who leave the nest quickly after hatching and need to be able to forage on bare ground while staying hidden. Non-native cold season grasses, like orchard grass and tall fescue, create an impenetrably thick understory on the ground that a young bobwhite can’t navigate. During the winter, quail need woody, shrubby cover, as in hedgerows and field edges, where they can shelter from predators and harsh weather. Unlike deer and wild turkeys, quail do not adapt well to a rapidly changing landscape, and their numbers throughout the habitat range, including the Eastern Shore, have been in steady decline since the 1960s. Recent heavy snow storms in 2010 dealt a major blow to already strained quail populations, depriving the birds of food and shelter for an extended period of time. However, where adequate numbers of birds survived, coupled with existing grassland habitat, quail populations have now rebounded to where they were before the blizzards. In working to re-establish habitat for quail on the college’s River and Field Campus, a 4,700-acre property along the Chester River, Small and others realized that what is good for bobwhites is also good for the Chesapeake Bay. Natural buffers that could provide the habitat so necessary for quail would also filter runoff that enters the Chesapeake Bay and its tributaries. In an effort to motivate landowners to create more habitat for the quail and, by extension, create buffers that would help reduce nutrients entering the bay, Washington College’s Center for Environment and Society in 2015 partnered with the Chester River Association (now part of ShoreRivers) with a $700,000 award from the Maryland Department of Natural Resources. Now in its third year, the Natural Lands Project has worked with 27 private landowners to create 375 upland acres and 36 wetland acres in Kent and Queen Anne’s counties. Small believes these efforts “should give us all hope that by adding new grassland habitat we can have a positive impact on quail populations on the shore. The project at Sassafras Natural Resource Management Area complements existing restoration efforts and provides an ideal wildlife habitat as well as educational opportunity for visitors to the park. Walking and horse riding trails will be established which will be enhanced by permanent informational signage in coming months. The grounds are also well regarded by birding enthusiasts for the variety of species found there. The Sassafras Natural Resource Management Area is one of 75 parks and public lands in the state that are operated by the Maryland Park Service, a unit of the Department of Natural Resources. Article by Wendy Mitman Clarke and Timothy Hamilton—Washington College director od media relations and Maryland Park Service business and marketing manager, respectively. Appears in Vol. 22, No. 1 of the Maryland Natural Resource magazine, winter 2019. Portions of this story were previously published in Washington College Magazine.